KTCCS (KIPS Tr. Comp. and Comm. Sys.) was merged and renamed from The KIPS Transaction: Part A (1598-2831) and The KIPS Transaction: Part C (1598-2858), which were first published in 1994. 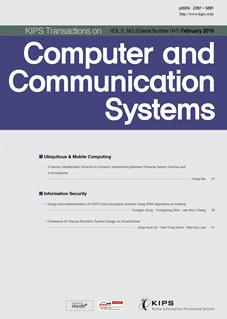 After the official meeting of the Korea Information Processing Society in April 13, 2012 in Seoul, Korea, the board members of the Society decided to publish the journal dealing with computer and communication system research not only in Korea but also in the world. This work was supported by the Korean Federation of Science and Technology Societies (KOFST) grant funded by the Korea Government (MOSF&MSIP), indexed by Korea Science, Korea Citation Index (KCI), and EBSCO. With regard to ethical standards, KTCCS (KIPS Transactions on Computer and Communication Systems) takes plagiarism very seriously and thoroughly checks all articles. KTCCS defines research ethics as securing objectivity and accuracy in the execution of research and the conclusion of results without any unintentional errors resulting from negligence or incorrect knowledge, etc. and without any intentional misconduct such as falsification, plagiarism, etc. When an author submits a paper to the KTCCS online submission and peer-review system, he/she should also upload the separate file "author check list" which contains a statement that all his/her research has been performed in accordance with ethical standards. Among the KTCCS editorial board members, there are vice editor-in-chiefs who support the KTCCS by dealing with any ethical problems associated with the publication process and give advice on how to handle cases of suspected research and publication misconduct. When the KTCCS manuscript editor (or the KTCCS secretary) looks over submitted papers and checks that they are suitable for further processing, the manuscript editor also routes them to the CrossCheck service provided by iThenticate. Based on the results provided by the CrossCheck service, the KTCCS vice editor-in-chiefs inform the KTCCS editor-in-chief of any plagiarism that is detected in a paper. Then, the KTCCS editor-in-chief communicates such detection to the author(s) while rejecting the paper. 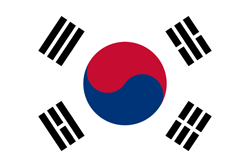 Since 2012, all papers published in KTCCS are subjected to a peer review and upon acceptance are immediately made permanently available free of charge for everyone worldwide to read and download from the journal’s homepage (http://ktccs.kips.or.kr) without any subscription fee or personal registration. They are 'Open Access' papers distributed under the terms of the Creative Commons Attribution Non-Commercial License (http://creativecommons.org/licenses/by-nc/3.0/) which permits unrestricted non-commercial use, distribution, and reproduction in any medium, provided the original work is properly cited. This policy supports and encourages the publication of quality papers, making the journal an international forum for the exchange of different ideas and experiences. All publications of KTCCS is indexed in DOI, EBSCO, Google Scholar, Crossref, and CrossCheck. KTCCS is also selected as the Journal for Accreditation by NRF (National Research Foundation of Korea).